HydroWorx’s cold plunge pools keep water temperatures at a therapeutic 50° to help control joint inflammation and enhance muscle recovery. HydroWorx’s ThermalPlunge pools are equipped with thermal heating units to distribute warm or hot water (94° — 104°) to relax tight muscles and stimulate the release of endorphins. Powerful massage hoses easily attach for specific deep tissue therapy. Combine the thermal and polar therapy pools to promote rapid recovery with maximum convenience. Modular design and size provides ultimate flexibility for facility design. Choose from three size configurations (7’6” x 7’6”, 7’6” x 9’, 7’6” x 14”). What do hot and cold plunge pools have to offer? One of the best ways to prevent injuries such as muscle pulls, strains, etc. is to relax tight muscles prior to rigorous activity. The ThermalPlunge pool temperature ranges from 94 degrees to 106 degrees, which raises body temperature, increases circulation and stimulates the release of endorphins. Water also creates buoyancy, reducing body weight and relieving pressure from muscles and joints. 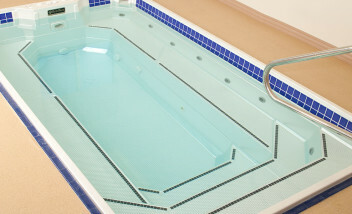 Cold pool therapy (water 50 degrees) helps control joint inflammation and enhances muscle recovery. Strategic jets can be positioned in any format including trigger point patterns for a soothing massage. Powerful massage hoses easily attach for specific deep tissue therapy. The HydroWorx ThermalPlunge and PolarPlunge pool can be installed in ground, partially above ground and above ground. How many people do the plunge pools accommodate? 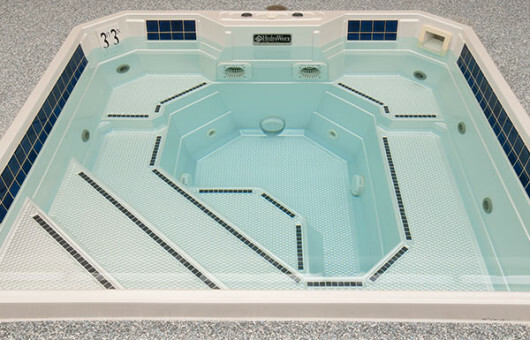 Each of the four models operates as a multi-person (4-10) therapy pool and they are ideal for locker rooms, athletic training centers, or fitness facilities. With four size configurations to choose from, the Thermal and PolarPlunge pools can be placed together in a cold, warm or hot format to promote rapid recovery and maximum convenience. Who are a few of your ThermalPlunge and PolarPlunge customers? 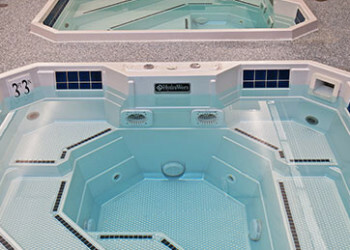 These warm water aquatic therapy pools are filled with innovations designed to create an environment ideal for muscle recovery and revitalization. HydroWorx’s ThermalPlunge pools are equipped with thermal heating units to distribute warm or hot water (94° — 104°) to relax tight muscles and stimulate the release of endorphins. Powerful massage hoses easily attach for specific deep tissue therapy. ThermalPlunge pool therapy heats muscle and tissue to increase circulation and restore blood flow to the body. The warmth of the water promotes a transient reduction in joint stiffness, pain and muscle spasms. It can also help to reduce inflammation. The typical temperature of a hot pool ranges from 94° — 104° to relax tight muscles and stimulate the release of endorphins. 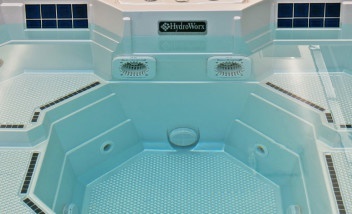 HydroWorx ThermalPlunge pool models also come with an attachable massage hose to offer a deep penetrating massage to sore areas of the body, further enhancing muscle recovery. “Getting your neuromuscular and endocrine systems regenerated can steepen the dose-response relationship to the training. Passive recovery is certainly important, but ‘active’ recovery techniques using HydroWorx are catalyzing our regeneration timelines.” — Lance Walker, Director of Performance at Michael Johnson Performance. Clinical studies supporting the benefits of aquatics are ample, and we have listed many relevant examples on our Research & Education page. A number of studies have looked specifically at the benefits of exercise in a hot water environment and found equally encouraging results. A 1996 study of older adults found clinically significant range of motion improvements in the shoulders and hips, increased shoulder and quadriceps strength, and improved walking speed. The study — which involved 24 sessions in a 94°F therapeutic pool, held over a period of 12 weeks — concluded that the exercise led to “significant improvements in reported pain and in social function” (Activities, Adaptation & Aging. 1996; 20(3): 75-85). 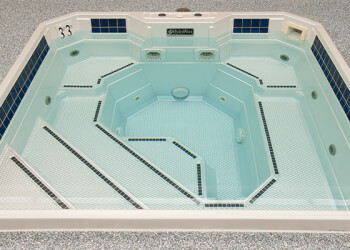 A more recent case study of a 33 year old woman with multiple sclerosis found that regular aquatics in a 94°F therapy pool was “associated with the improvement in functional abilities.” The patient was monitored for body temperature, heart rate and other factors, and found no instances of heat or fatigue as a result of exercise in the hot water environment (Physical Therapy. 2001 April; 81(4): 1049-1058). You can find out more about the benefits of a Thermal Plunge pool by ordering your free information kit today. We also offer regular product demos in locations around the country. Contact HydroWorx today to reserve your spot at an upcoming session. 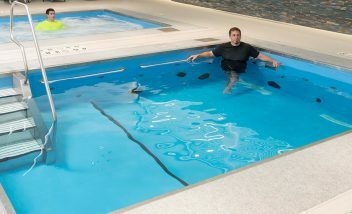 The PolarPlunge line of HydroWorx pools offers clinicians the ability to provide cold water therapy to their athletes. Proven to offer a number of benefits — particularly when alternated with hot water therapy — PolarPlunge pools are an excellent addition to any athletic facility. 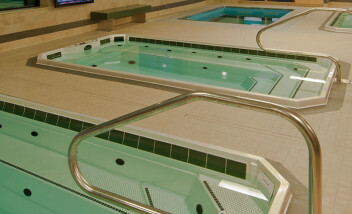 These cold water aquatic therapy pools are filled with innovations designed to create the ultimate muscle recovery and revitalizing environment. HydroWorx’s cold plunge pools keep water temperatures at a therapeutic 50° to help control joint inflammation and enhance muscle recovery. Strategic jets can be positioned in any format including trigger point patterns for a soothing therapeutic massage. Powerful massage hoses easily attach for specific deep tissue therapy. 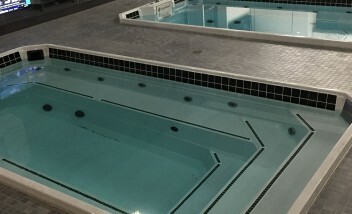 HydroWorx PolarPlunge pools can be found in the athletic training rooms of some of today’s top sports teams, including the Philadelphia Phillies, the Detroit Lions and the Ottawa Senators. Read more — and hear testimonials from some of our satisfied client — by visiting our Customer Profiles page today. The benefits of a cold plunge pool, both for physical therapy and athletic training, have been well documented. Physical Therapist Cara Konlian writes in the Journal of Orthopaedic Nursing that, during aquatic therapy, “the temperature of the water can be one of the most important factors in facilitating progress.” (January/February 1999). In a study of high-performance junior male soccer players, researchers at the South Australian Sports Institute found cold water immersion reduces “the perception of general fatigue and leg soreness between matches in tournaments” (J Sports Sci. 2009 Apr; 27(6): 565-7). Positive outcomes have also been reported from treatment that alternates between hot and cold pool therapy. A study by the Australian Institute of Sport concluded that contrast water therapy “seems to be effective in reducing and improving the recovery of functional deficiencies that result from DOMS [delayed onset muscle soreness]” (J Strength Cond Res. 2007 Aug; 21(3): 697-702). “The contrasting is very time efficient taking less than 10 minutes to fully complete a 2:1 or 1:1 cycle of hot:cold immersion with massage. With contrasting, the CNS/ANS is recovering faster and more completely. The athletes are back the next session with higher functioning levels of neuromuscular firing and a reduction in ‘wasted’ training sessions due to staleness or effects of overtraining — which is usually a result of ‘under recovering’.” — Lance Walker, Director of Performance at Michael Johnson Performance.